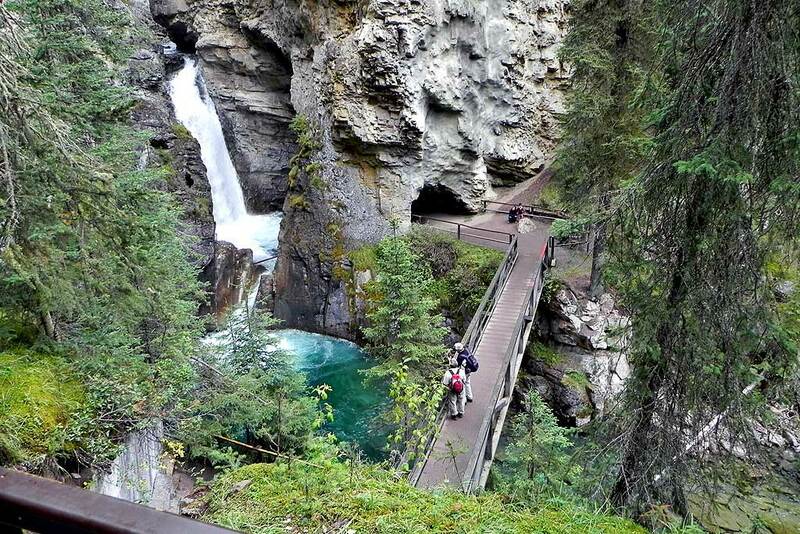 Hiking Johnston Canyon is a great area to spend time at in Banff National Park. The canyon is located just off the Trans Canada highway on the Banff – Lake Louise Parkway at the Castle Junction intersection. 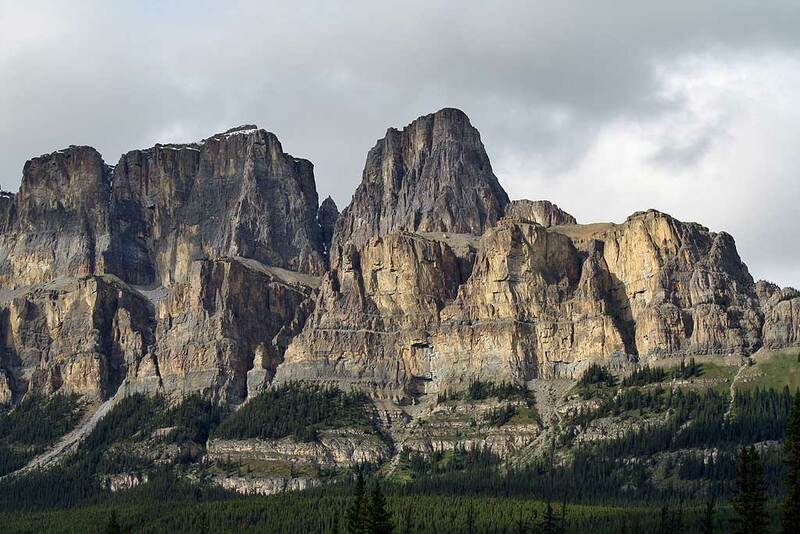 It is 30 minutes by car west of Banff and 30 minutes east of Lake Louise. The Banff-Lake Louise Parkway is the original 2 lane road along the Bow Valley and parallels the Trans Canada, but it’s on the opposite side of the Bow River. 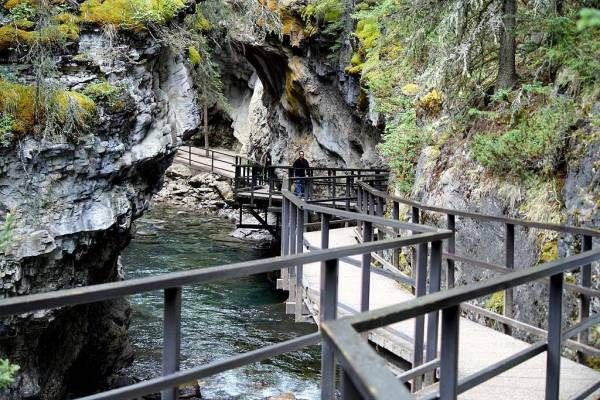 There are 132 campsites at Johnston Canyon Campground. 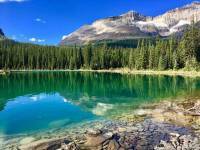 You can also stay at the Johnston Canyon Resort or nearby at Castle Mountain Chalets. 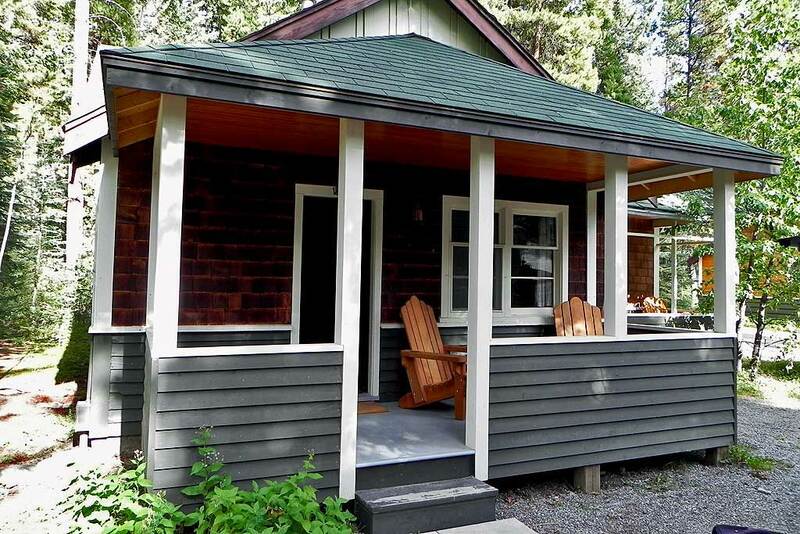 We stayed at the Johnston Canyon Resort. The resort has expanded from about 5 cabins in the early 1970s to more than 40 units in 2010. It is strategically located right at the trail head to Johnston Canyon. Rooms are rustic cabins with wood burning heaters. There’s a restaurant and coffee shop to accommodate tourists after their hiking. The location is still fairly busy in early September. The crisp temperatures make the fireplace in the restaurant a cozy place at that time of year. It was chilly in the early morning air when we made the half mile hike to the Lower Falls of Johnston Canyon. German was a commonly spoken language among the hikers on the trail. The Lower Falls aren’t very high, but they are intimate, interesting and beautiful. You can view the Lower Falls from higher up on the trail and then from a bridge at the base of the falls. You can also cross the bridge to find a tunnel through the rock to a small viewing nook. This gives you a close up and wet view of the falls. After the Lower Falls, it’s another mile to the Upper Falls. 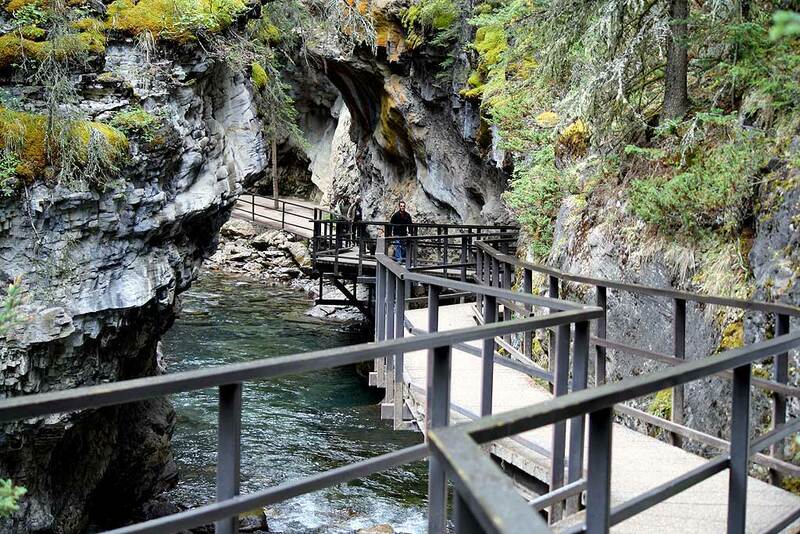 Along the way, the trail along the Johnston River is forced over the river as the canyon narrows. The trail then uses a steel walkway just a few feet over top of the river. This is my favorite part of the hike. The Upper Falls have a much greater height. There are guard rails and platforms to lean out on to fully see the canyon here. You can’t get up close and personal like you can at the Lower Falls though. Just before the Upper Falls we missed out on the “Secret Trail” down a slippery slope to a cave at a bend in the river. The rock formation looks like kind of like James Bond Island in Thailand. After the Upper Falls, we continued up the trail for another half hour, but the trail became quite steep. So, we turned back instead of persisting on toward the Ink Pots (naturally heated mud holes). The Ink Pots destination makes the return trip a total of about 5 hours. When we returned to the trailhead, the restaurant was a few minutes from closing down their breakfast menu. It’s amazing how good bacon and pancakes can taste as you eat beside a crackling fire after a chilly hike.